Wow, thank you for that, Danigral. Like Toqtamish I've been flirting with the idea of giving CoC a swing (though I'm in the process of a move for the next month and a half or so, so I probably wouldn't take the plunge until August at the earliest). As primarily an AGOT player, that was a great read that did a fantastic job laying out the similarities and key differences between the games. I've played most of the LCGs at this point, though Star Wars is the only other one I've kept up with. Once I'm settled after the move, I'll definitely go about finding a local CoC playgroup and see what I think of this game. I see your profile says you're in Atlanta (although I don't know about after your move). You're welcome to come and join our group and we'd be happy to teach you how to play. We meet on Tuesday nights at The Raven's Nest in Marietta. We show up around 5:30pm and play until about 9:30-10:00pm. New preview up, this time showing Tom's 2011 champion card. A really interesting card IMO. Awesome! 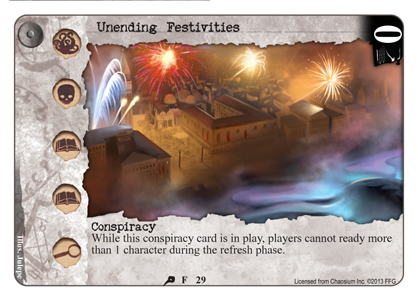 Conspiracies has needed an overhaul and some new cardboard since the (bad) decision to make them work equally for both players (meaning conspiracies that give "your" characters a bonus gives the bonus to the opponents characters as well). 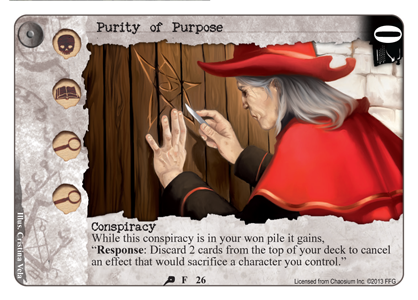 This will hopefully shake up the game a bit and I love both the other conspiracies spoiled and Toms card seems really nice. It seems very much skewed towards weenie rush decks though, another feather in the hat for MU I guess. Interesting card, although I must say I don't consider it the best likeness of Tom - it has a comic book look to it or something. Looks like it circumvents the Prepared Alienist too which I think was a good call. Anyway, a lot depends on when it comes out. If very early, then it would nicely with a rush deck, but if played later you could be stealing a pretty nice character. What I really like is that it has interesting effects even if nobody wins it. You can play it to remove an important character solely to do that, and then take advantage of their absence to win the game at another story. ... if played later you could be stealing a pretty nice character. What I really like is that it has interesting effects even if nobody wins it. You can play it to remove an important character solely to do that, and then take advantage of their absence to win the game at another story. Yes, fits very nbice in a cthulhu deck withDragged into the Deep (WoP). Let your opponent try to win the conspiracy, because he wants his character back! ... then remove it before it's won and steal your opponent the activities of a storyphase. The thing with the new championship card: if you play many evenly matched chars you don't mind it. If you play an AO-rush deck of any kind you really don't like. It's also a great way of removing your opponents only blocker at the beginning of your operations phase before playing your own characters. This looks very cool, and brings Night & Day back in a big way. 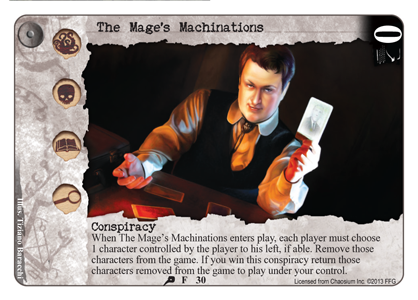 The Conspiracies sounds awesome too, FFG is really going all out to reinforce some under-used mechanics in this set. So just speculation here, but what if this pattern continues? Two faction boxes, then a setting box. It'll take longer to get all the factions out, but the late factions will get more cards in a setting box than they would in a faction box I think - plus it's the perfect place to concentrate on enhancing mechanics. I could go for that. How about Syndicate, Hastur, and an Orient Express themed box for the next trio then? Anyone with me? Just read through the whole thread and you sir have my vote! Looks like it circumvents the Prepared Alienist too which I think was a good call. Why do you think this? Isn't this a "triggered effect" ? The difference in wording between "put into play" and "return to play" I guess? I am not fully convinced myself it actually circumvents the Alienist. It's a powerful effect, but I think the Alienist will prevent you from returning the removed characters. It's a first, though: The characters are actually removed from the game - whew! We didn't have anything like that yet in CoC. I believe Prepared Alienist will block the character from changing control, that's it right? Elder Chasm (TKatG) or similar effects...) or just winning the stories by yourself?! If opponent doesn't want to win the conspiracy, use Hack Journalist (DD) or Maurice Diggs (SoK) to let him win it! okay, it's very theoretical and really needs a bunch of cards, but it's nasty, isn't it? I would say an epic way to win the game if it works. My thinking is that "return to play under your control" is not the same as "changing control". The card was out of play. It HAD no controller. Coming into play under someone's control is not changing anymore than playing a character from hand who suddenly becomes under your control is changing. Removing cards from play, and bringing them back is quite big and needs some rulings. Maybe here will be more "exhile" in Terror in venice. This whole discard recursion could use a good exhile to stop it. Did people see the other two? This makes the last of the 7 conspiracies I believe. The first will be good for a rush deck as sacrifice effects were really their last major weakness. The other will be nice for control decks with big baddies. I think Unending Festivities would also be good for Syndicate as a way to strengthen their exhaust effects. Would also go well with a Syndicate/Silver Twilight to secure the Arcane struggle. So far, since FFG stopped releasing APs, every Deluxe set added new rules. It looks like Terror in Venice is no exception.